TC XPERT | ARKRAY, Inc.
TRUST CHECK XPERT TAKES BP MONITORING TO THE NEXT LEVEL BY MAKING IT MORE PERSONAL TARGET ORIENTED.Allows to set personalized targets for BP.Each time a measurement is done,the screen color changes indicating whether the reading is within target or not.Makes it easy to differentiate readings within the family. 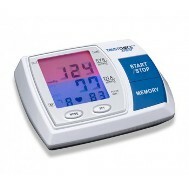 Each user can store upto 40 readings.Detects & Warns in case of any abnormal heartbeats (arrhythmia). Humidity : 15- 90 % R.H.